A blood filled female of the malaria mosquito genus Anopheles messae photographed in a stable outside Uppsala. Photo: Thomas G. T. Jaenson. Malaria was a widespread disease in Sweden until the 18th and 19th centuries. 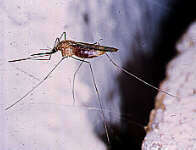 It was spread by malaria mosquitoes, Anopheles, a genus containing the 45 species of biting mosquitoes in Sweden. In those times people had no separate buildings for the cows to live in during the winters. People and cattle lived under the same roof. It was dark and damp and provided a nice environment for the mosquitoes to spend the winter, and the malaria was spread. Today there are still malaria mosquitoes in Sweden, but the disease disappeared from our country in the beginning of the 20th century. How come that it disappeared? There are several reasons for the decrease of malaria. The most important reason was that people built better houses and started using separate buildings for the cattle to live in. The mosquitoes liked it better together with the cattle where it was dark and damp than in the drier houses where the people lived. Since the malaria parasite could only survive in human blood, the disease decreased radically. The malaria parasite decreased in number even more during the cold summers in the 1860's, and further the malaria mosquitoes decreased in numbers when the wetlands where the larvae lived were drained. At the same time people started eating malaria medicine and that was the end of it.